I’m not a coffee drinker but I do wear glasses. Coffee is one of those things that I got turned off to as a kid. My mom would drink it every once in a while and I would tast it out of curiosity. It was way too bitter for my kid tastebuds. As I grew up my dislike for coffee was compounded by horrible people that gave out coffee flavored candy to me at halloween. I would unwrap a nice friendly looking piece of candy and pop it in to my mouth expecting something chocolate or maybe root beer and seconds later have to spit it right out. Most everyone else I know can’t live without coffee. I witnessed many an argument over who is supposed to fill the coffee machine at work. At least Starbucks sells hot chocolate. When I’m with a group of people that need to make a Starbucks run I still get a nice warm cup to hold in my hand so I don’t have to feel like a total outsider. He takes a lot of damage to the head doesn’t he? I enjoy the fact that it takes him a few tries to get things right, but he never seems to actually ‘get it right’! And I agree with Chris. I know exarctly how you feel. I actually find myself drinking coffee at work sometimes (I have been habilitated to the flavour through a sort of medicinal use on mornings after long nights) and stopping and thinking, “wait, I don´t actually LIKE coffe”. Amen Chris, coffee is evil and slowly taking over our civilization (should civilization be in quotes?). 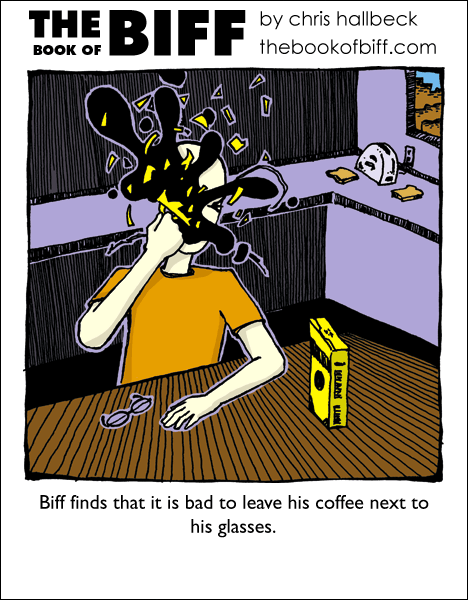 I mean, look at Biff.. there are hidden dangers.. he probably can’t wait to get his next cup.. I like the milkshakes at Starbucks. I especially like going into a Starbucks and ordering a small/medium/large milkshake. I hate coffee, but like capacino, uhm, cappachino? The stuff thats made from coffee but has enough additives that it tastes so much better. (it remains a rare treat i get twice a year). wait…………..(insert squeeky hamster wheel noise here)……….HE WEARS GLASSES!!!!!! Worse still never buy washing up liquid in one of those clear bottles when it is the same colour as the olive oil. Washing up liquid in a frying pan doesn’t work quite the same. is that tim hortons coffee? because tim hortons coffee is like 5000 degrees Celsius when they give it to you. I think its the only coffee that could light your face of fire. Starbuks does make excelent hot chocolate. their lattes are kind of bitter because ot the beans they use. i still love their carmel Machiattos thought–they’re the second sweetest drink on the menu after hot chocolate. if you ever tried a carmel machiatto, i wouldn’t be surprised it it changed the way you feel about coffee–it certainly did me. Apparently his glasses are rather heavy, explaining why he so rarely wears them, and how he can mistake it with a pot of coffee. anyway, as a kid, I liked coffee more than I do NOW. I mean, I love coffee, but it has to have at least 1/3 milk added to it plus 2 spoonfuls of sugar when I drink it. When I was about three or so, I would guzzle down my Grandmother’s BLACK coffee when she was in another room. I live on tea. Tea is the elixir of life. Coffee is only for recreational purposes. I prefer coffee made by a barista. I’m very spoiled…I also wear glasses so I don’t mistake a burly biker for an information desk worker. Also, I lose my glasses on a regular basis, so I yelled for help in finding them. I LOVE Starbuck’s hot chocolate, especially the peppermint kind. I is am are coffee addict. And if biff is like me, some people put on their glasses (In my case, sunglasses) very quickly. I hate coffee, and I always have. Starbucks’ hot chocolate isn’t even good. heh…see I’m an anti-corporation kinda-girl 🙂 I just stand there and cover my face form on lookers whenever I’m with a group that decide to take a Star bucks run….or I just hop away to the nearest smoothie shop and order a nice Dairy-free Green Tea Smoothie. heh…see, I’m an anti-corporation kinda-girl 🙂 I just stand there and cover my face from on lookers whenever I’m with a group that decide to take a Star bucks run….or I just hop away to the nearest smoothie shop and order a nice Dairy-free Green Tea Smoothie. Man, when Biff puts on his glasses, he PUTS ON HIS GLASSES! What’s this? Something I have to read? WHAM! Instant reading! Hot chocolate’s good, but I only drink it in the winter when I’m cold. Has anyone else noticed that Biff has never worn glasses before or since this comic? i hate coffee, it turns people’s faces wrinkly and brown, not only that they are squintier than asian people. I’ve just gotten used to being an outsider. I highly recommend it. Oh hey! That’s how I got the lacerations on MY head too! I started drinking coffee when I was two. I still love it. I also love coffee flavored candy, and ice cream. How cruel! D8 I would never give coffee-flavored candy to children! I’m not a coke drinker, it’s too sour for me. It’s just so SOURRRRRRRRRRRRRRRRRRRRRRRRRRR. But I loooooooooooooooooooooooove coffee!!! It’s a real treat, and it’s not bitter at all! But yeah, most people like Coke, I understand. It’s refreshening. But it’s SOURRRRRRRRRRRRRRRRRRRRRRRRRRRRRRRRRRRRRRRRR. If he’s blind, why does he have glasses? I prefer to feed my caffeine addiction with soda.